Candidates for ministerial priesthood in the Roman Catholic Church are admitted to the seminary's Program of Priestly Formation under the sponsorship of a bishop. The program provides the candidate with personal and spiritual formation and an educational experience in the theological disciplines, so that he will be well equipped for that particular integrity of life and service that the Roman Catholic Church expects of its ministerial priests. 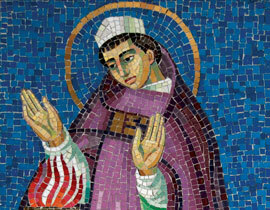 In his Post-Synodal Apostolic Exhortation, Pastores dabo vobis, entitled by words from the Book of Jeremiah — "I will give you shepherds after my own heart" (3:15) — Saint John Paul II describes the seminary as an "educating community" whose life, "in all its different expressions, is committed to formation, the human, spiritual, intellectual, and pastoral formation of future priests" (par. 61). This mandate, given particular application by the United States Conference of Catholic Bishops in the document Program of Priestly Formation, inspires and shapes the goals and activities of Christ the King Seminary. The seminary's Program of Priestly Formation encompasses the following major efforts which, although distinct, are organically interrelated: (a) the program of human and spiritual formation; (b) the academic curriculum; and (c) the pastoral education program. The faculty and resources of the seminary are dedicated to providing the environment, education, and example needed by seminarians (a) to become progressively more familiar with the presence of the Lord in liturgical and personal prayer, (b) to grow in personal self-awareness and in the awareness of others to be served, and (c) to acquire competence in the knowledge and skills demanded by the pastoral ministry of communicating and living the Gospel of Jesus Christ. This part may involve many years. Some people think about priesthood for a long time ~ even from youth. Some, after discovering the call, act on it right away. Others discover this call only later in life (for some, much later). A good portion of internal discernment involves reflection, prayer, and listening to God. Being involved in one's parish, going to Mass regularly, receiving the sacraments, attempting some type of Christian or community service, and trying to live a good Christian moral life are just some of the ways that often help to bring one's call into focus. The Buffalo diocese offers various programs to help the individual discern his call from God. Some of these include St. Joseph Club and Response Group meetings. If the person, after prayer and thought, decides that he wants to proceed, he can then begin the application process. For an individual to apply, he must first meet several criteria. The applicant must be a baptized and confirmed Catholic male. He must have at least completed high school or be within a year of completing high school (e.g. High School Senior). The person must be in good health and not bound by marital obligations. The candidate would then fill out the appropriate application forms, submit sacramental certificates and academic transcripts, and provide references. The candidate would also have several interviews (with the Director of Vocations and other Board members) as well as undergo the necessary psychological testing and screening. After the completion of the above, the Bishop and the Diocesan Seminarian Board will meet, evaluate the candidate's application, and then decide to accept the candidate, reject the application, or defer it until some point in the future. Once accepted, the seminarian will begin preparation for the priesthood at the seminary the diocese sends him to. If a person comes from high school or with some college without finishing a degree, he would enroll at St. Mark's Seminary in Erie, PA. After completion of the college seminary degree (or special one-year program at the college seminary for those already with an undergraduate degree), the seminarian would then begin theological studies at Christ the King Seminary. After all the years of education, training, and preparation, the candidate comes to St. Joseph Cathedral for his ordination. (A seminarian is ordained a "transitional" deacon one year before being ordained a priest.) There, surrounded by family, friends, the priests of the diocese, and other religious and lay leaders, the bishop ordains the person to the priesthood. The ceremony, which is held within a Mass, includes a testimony of his worthiness and an affirmation by the assembly. The candidate then makes several solemn promises before God to the bishop. After that, the candidate lies prostrate on the floor as the Litany of Saints is sung. Then, in an ancient gesture, the bishop lays hands on the candidate's head, and then so do all the priests who are present. The bishop prays the prayer of consecration. The new priest is vested in the priestly Mass garments. His hands, which will offer the sacrifice of the Mass, are then anointed for their sacred duty. The bishop presents him with bread and wine and offers him a greeting of peace as the other priests welcome him into the Sacred Priesthood.